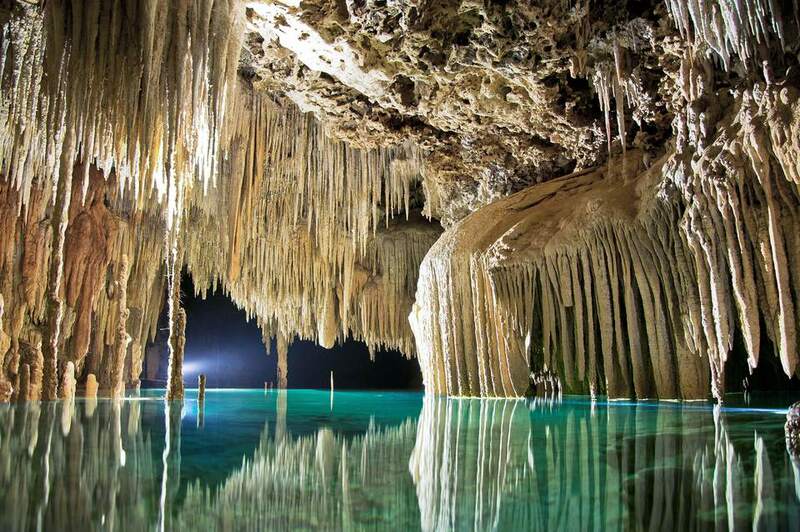 While driving south from Cancun along the only real highway to be found there, look for billboards urging you to visit the underground river in the caves at Rio Secreto. A jaded traveler may pass this place by, chalking it up to another hokey tourist trap. It is actually a can't-miss adventure however that should be on your list of things to do while visiting the Riviera Maya. 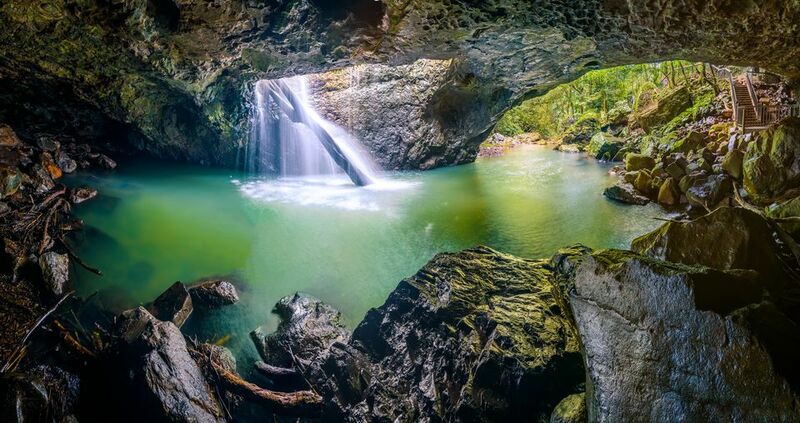 Walking, and at times swimming, in the river that flows through a semi-flooded cavern is sure to be one of the highlights of any trip to this region. Touring Rio Secreto, you'll get the chance to experience the wonders of a section of Mexico's longest underground cave system, which remains in a natural, almost completely untouched state. The section of the cave in this photo was illuminated to allow for photography because it beautifully shows the environment visitors will experience. However, as you travel through the caves in a small group led by a local guide, the only lights will be the ones on the helmets you and others in the expedition are wearing. Approximately 65 million years ago, a large asteroid hit the north coast of Mexico's Yucatan Peninsula, creating the 110-mile-wide Chicxlub Crater in the process. A long term study completed back in March of 2010, concluded that this is the very same asteroid that most likely resulted in the extinction of the dinosaurs. The top strata of the Yucatan Peninsula is mostly limestone, with a large, fresh water aquifer and thousands of openings––called cenotes––underneath. This is a perfect environment for an extensive underground cave system to form, complete with stalactites, stalagmites, and stone columns. Most of the passages are completely flooded and accessible only to scuba divers. Snorkelers can explore a few of the caves as well, although most are completely off limits. Rio Secreto was discovered in 2007, and although it sees frequent visitors, the formations found within remain intact today. It's a horizontal, semi-dry cave that permits easy passage without significant exertion. The passageway is surprisingly open and generally creates feelings of wonder rather than claustrophobia. When visiting Rio Secreto, first you're transported by van from the entrance of the park over a rough dirt road to an area where you'll meet your guide. You're assigned a locker, given a wetsuit, flotation vest, helmet, and light. You bring your own bathing suit and shoes with good soles for walking in the water (dive booties or water shoes are perfect). To keep the water in the river clean, and free from outside contaminants, you will shower before putting on your wetsuit. Along with a small group, a guide and a professional photographer, you'll walk a short distance to one of the entrances to the river. On some tours, you may stop along the way to receive prayers from a local shaman for a successful journey into the cavern, which was once believed to be the entrance to the Mayan underworld. Turn on the light on your helmet once you descend down a short set of wooden stairs because once you've entered the chamber with the lower river, you'll be immersed in complete darkness. Don't expect handrails here or lights other than your headlamps either. The goal is to minimize the human footprint as much as possible. The guide will show you where to walk and remind you not to touch any of the formations. Your trip will be a mix of walking along the cave floor in water up to your ankle or knees and swimming or floating in the river itself. Visitors aren't permitted to bring cameras. The stated reason is that if everyone stops to take photographs, it's difficult to keep the group together, which is a potential hazard. But the photographer (who is also a backup guide) takes photos during your excursions, which are available for viewing and purchase shortly after you leave the cave. Most of the time, you'll be walking along a designated passageway, sometimes on a dry cave floor, and other times in water that can reach as high as your knees. Occasionally, each member of the group must provide a hand to assist the following person around a rock or over the occasional tricky terrain. Your guide will point out different formations, such as a multi-colored veil of stalactites, and the few small fish that can be spotted in the water. When walking is not an option, you'll swim through small sections of the passage, as well. The provided flotation vests are excellent and do a good job of keeping you fairly high in the water. On the route, you may encounter small, fairly tight areas to float through on occasion, but they tend to be very short and sometimes there are even ways around them. If you're a non-swimmer, this shouldn't keep you from embarking on this experience. If you can't swim, you can float on your back and the guide will lead you through the deeper areas safely and securely. The trip through the sections of the Rio Secreto cave system that are open to the public takes approximately an hour and a half to complete. At the end, you'll exit through a natural cenote, which was once used by the ancient Mayans to access the fresh water found in the river. Modern travelers don't have to worry about scrambling out, however, as they can exit via the stairs. Once above the surface, again, you'll walk back through the jungle to the lockers, where you can shower and change clothes. Towels are provided and the "modules" where you find the bathrooms, lockers, shower, and changing rooms are designed to somewhat look like a Mayan village. After drying off and changing most tours typically provide lunch as well. You can find regular, daily tours into the Ro Secreto. Visitors will want to reserve tours in advance, however, because group sizes are kept relatively small. When you're tired of sitting on a beach, swimming, and playing golf, there are plenty of adventures for active travelers. Just off the strip of highway between Cancun and Tulum, located at the lower end of the Riviera Maya, there are many places where you'll find entertaining adventures. Ride a zip line into the water, race around the jungle in a dune buggy, or ride a raft in an underground river at the Xplore Park. Go snorkeling or scuba diving in a cenote and take a boat ride and swim in waterways that the Mayans used centuries ago at Sian Ka'an. The possibilities are practically endless if you venture away from the resorts and look for more opportunities to get channel your inner explorer.